The quonset hut with a backyard farm table dining setup. All photos by Northern Native Photography. Menu designed by Invitations By Caitlin. Featuring our light indigo hemp napkins. Amazing textural dried grasses and palm leaves by Studio Terrain with tall pale blue tapered candles helped create a romantic ambiance. Nadia in her Detroit Bridal House gown holding her sprawling bridal bouquet. Features rust & sand colored silk ribbons by Rosemarine Textiles. A flat lay featuring watercolor invitations designed by Invitations By Caitlin. Shown here is Rosemarine Textiles 2" wide deep chartreuse silk ribbon in chiffon and 1" wide light indigo ribbon in chiffon. 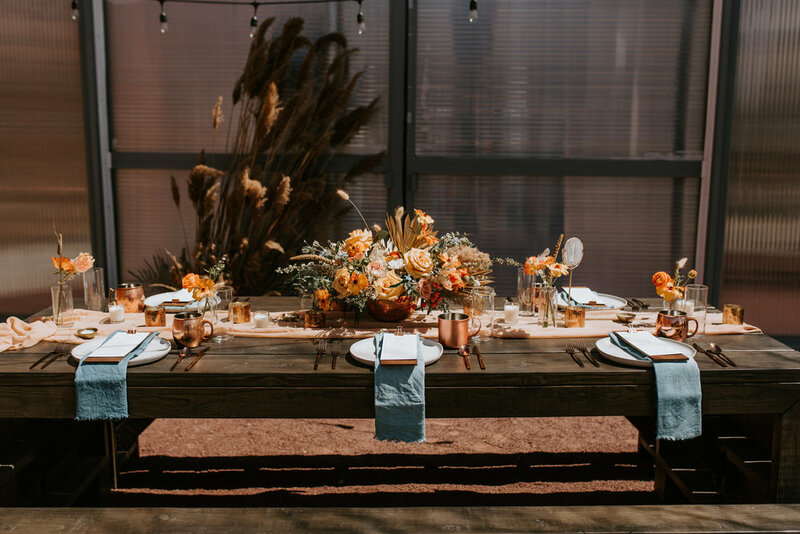 Beautiful and expansive peach toned floral centerpiece by Studio Terrain. A few months back I had the pleasure of participating in a creative and unique styled editorial designed and coordinated by Miranda of Spoke Events. 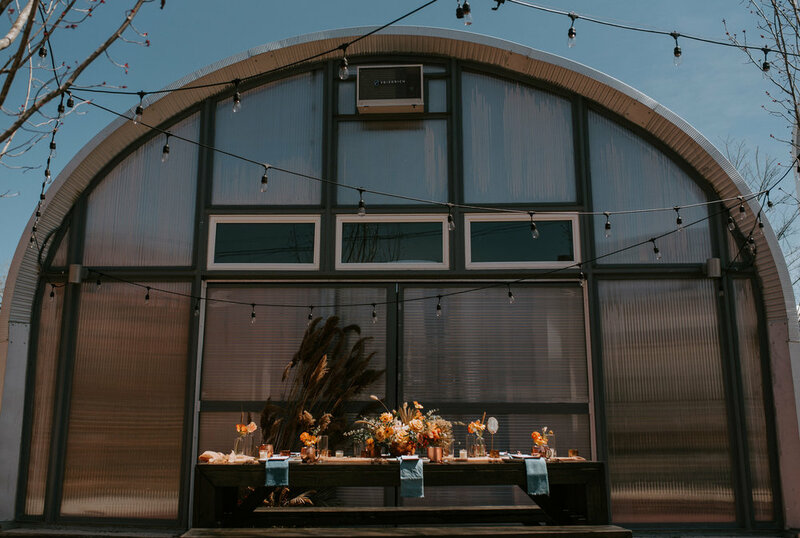 The shoot took place at Jesse David Green's Quonset Hut Air BnB at True North Detroit - a truly unique space with tall ceilings and a very cozy but modern design. The scene included a bride and groom (Nadia and Chris) getting ready for their wedding, relaxing in the hut and then sitting down to enjoy a lovely farm table dinner outside in the backyard. The color palette features warm tones like rust and peach with contrasting blues. All photos were taken by Cassie of Northern Native Photography. The bride's gown was from Detroit Bridal House and the bride's makeup was done by Emily Morss. The stunning florals were designed and created by Fatima of Studio Terrain. Menu and invitations designed by Invitations By Caitlin. Rosemarine Textiles contributed a blush pink chiffon table runner, indigo hemp napkins and silk ribbons for the bridal bouquet and boutonniere. 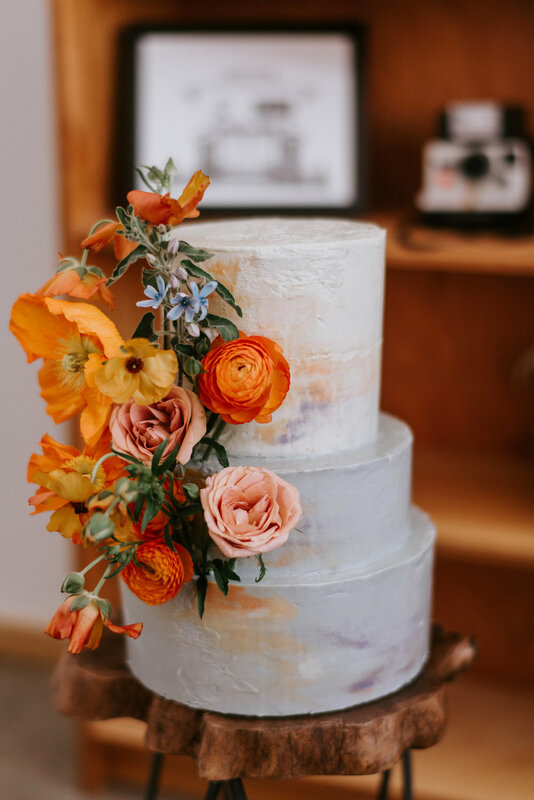 The tiered cake was created by Corinna of Amalia Bakery Detroit. This shoot was so much fun to be a part of! I absolutely love how the images turned out and am excited to be featured again on Wedding Day Magazine. A bright and elegant 3 tiered cake by Amalia Bakery Detroit. A zesty grapefruit spritz cocktail. The lovely bridal bouquet featuring our 2" wide habotai silk sand colored ribbon and 2" wide rust chiffon ribbon. A sweet little textural boutonniere featuring a 1" wide light indigo chiffon ribbon. 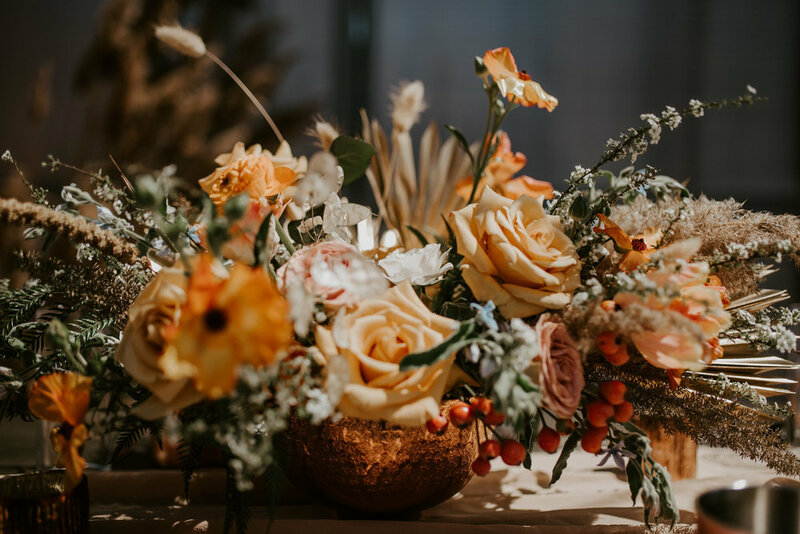 l love this beautiful and creative shot of the bouquet by Northern Native Photography. 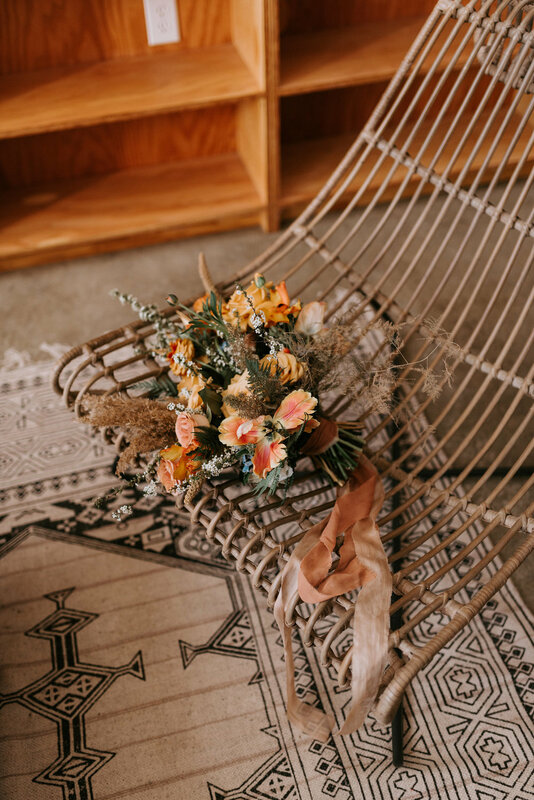 The warm autumnal tones of the flowers Fatima of Studio Terrain designed went so well with Rosemarine Textiles 2" wide rust chiffon and 2" wide sand habotai silk ribbons.